University preaching in the UK reaches new heights! 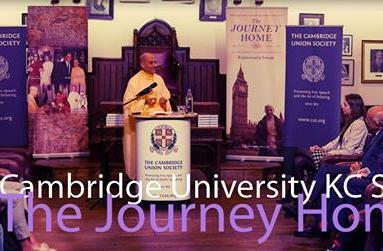 By the mercy of Srila Prabhupada and Lord Caitanya, university preaching in the United Kingdom has reached spectacular new levels! From the start of this academic year, Krishna has allowed us to have 30 Krishna Consciousness Socieies (KC Socs) across the country, the largest number to date! KC Socs up and down the country run with the same formula: Philosophy, Kirtan and Prashadam. KC Socs aim to make Krishna Consciousness relevant to the youth of the UK by having stimulating sessions based on topics such as: “What would you do if you had 24 hours to life?”, “Why do bad things happen to good people?” and “Wasn’t life much simpler when apples and blackberries were just fruits?”, but with a spiritual twist. As the first event’s across the country began to take place, record attendance’s were seen! Many universities had more than 60 students come to their first events, compared to usually 30. Every student was seen leaving with a belly full of Krishna Prashadam and a happy smile! However, the highlight of this year’s preaching to date has been the bi-annual KC Soc retreat to the Bhaktivedanta Manor, the property donated by George Harrison to Srila Prabhupada in 1972. This year had been the biggest retreat we’ve ever seen with 269 students from across the country! The day consisted of many activities throughout the day including a Temple Room tour, cow milking, Krishna Conscious seminars, a dramatic production put together by Pandava Sena, Bhaktivedanta Manor’s youth group, and ending with a Kirtan that got everyone on their feet! As the weekly sessions continue, there shall also be flagship events; the next of which will soon be taking place in London and in Leicester, with crowds of up to 250 people expected! We thus humbly beg for the mercy and blessings of the devotees that we may successfully preach Srila Prabhupada’s message around the country, and that many devotees are made.